In the forest lived a family of grizzly bears. Goldie “daredevil” Locks was an 8-year-old tomboy who’d recently chopped off her blonde curls with a hacksaw blade. She lived in a lakeside shack with her father, not far from the bears’ den. 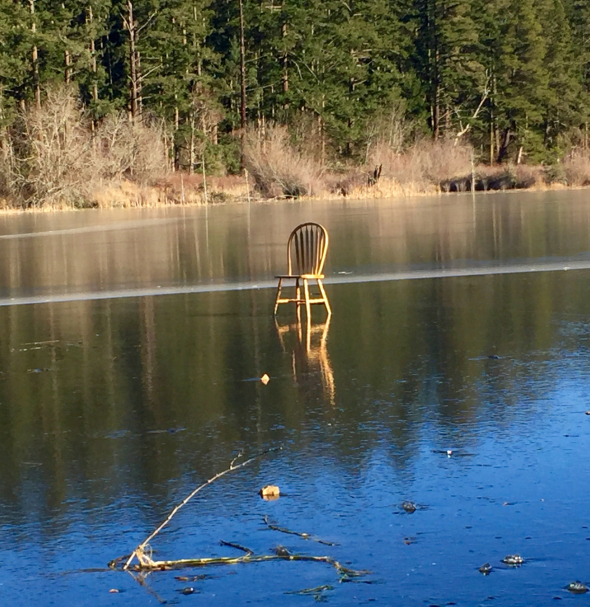 After Pa had forgotten to feed her for the umpteenth time, she stole his chair when he was drunk and set it up in the lake to do a spot of fishing. She hated fish, but reckoned on trading her catch with the bears for some honey. That day they feasted upon fish, followed by Goldie honey pudding. I like the thought of never knowing. Oh…a rather grisly take on the old favorite, or grizzly take. Goldie honey pudding? It doesn’t sound like the bears were much for trading. It’s also a sadly realistic tale in some ways, isn’t it? Well turned. Thanks. Am glad you liked the turning. Believe it or not, I do like bears but wouldn’t dream of trading with them. They say to never carry snicker bars with you when camping in places where bears live. They will rip your tent to pieces to get at those chocolate delights! Interestingly, I read that bears prefer to eat immature bees, but will eat honey instead, if there are not enough of them available. Oh dear! Count on you to have Goldie turned to honey pudding! Takes fairy tale to a whole ‘nother level! Hee-hee 😀 I just can’t help it. Good fun, Sarah! I like these little fiction pieces. I’m so long-winded I probably couldn’t write one, but I do enjoy your efforts. Have a brilliant weekend, my talented friend. Hahahahahaha! This was great! The old joke is Goldilocks was a nymphomaniac because she liked sleeping in other people’s beds. Thanks, Kent 🙂 The only sleep that my Goldilocks got, was the sleep of death, so she never got the chance to grow up and become a nymphomaniac! As far a papa bear coming home alone, I believe that they hire out bear suits for certain sorts of adult games that I’ll not detail on my blog. Please note that my comment is not based on experience but hearsay. …There’s naught stranger than folk. Yes, you’re right about that. I think some of them had gruesome endings to scare children into behaving. Yes. And some simply reflected the values and cultures of the times. Pretty harsh. Enjoyed the evil twist on the nursery rhyme. Not a version I will share with the kids until they’re a bit older! No Little Red Riding Hood for them either. That wolf gave me nightmares as a young child. Once, when I had a high fever, I hallucinated it standing my my bed, its eyes glowing in the dark, its mouth salivating, and its teeth ready to eat me. I could even smell its bad breath and feel the heat of it on my face. I couldn’t sleep with the light off for ages after that experience. Eeek! Moral of this tale: Never try to make deals with bears. …apart from offering them your backpack full of Snicker bars in lieu of them eating you! Oh so the bears finally got fed up with her stealing their porridge, sitting in their chairs. Can’t say sh didn’t have it coming. I’d get very fed up if someone kept stealing my porridge, after I’d gone to all the trouble of making it, especially once I’d spooned my honey on top! That girl was trouble from day one. I bet if you’d had more than 100 words we would have learned how she tried to cheat the bears, or kidnap baby bear (Cubby) and hold him hostage. I reckon you’re right there. Just think what she would have been like as a teenager, if she’d lived that long, considering she was already 8 going on 18 when she got eaten by the bears. A failed entrepreneur, big-time! Still, as long as the bears didn’t go hungry… Nice take. I loved this re-working of an old classic! …the worst indigestion, to stop them eating any more young girls! Great storytelling, too – you’re great at it! Thank you, Cynthia 🙂 This is only my second attempt at a re-do of a classic. I wrote a longer story called Rupert Wilt-skin, based on Rumplestiltskin. It revolved around a crime boss! Which ones have you done?